2Department of Pharmacy, Centre for Research and Development, PRIST University, Thanjavur, Tamil Nadu, INDIA. Objective: The traditional Indian food is “functional” as it contains high amounts of dietary fiber, antioxidants, and probiotics. Rasam is a South Indian traditional spice soup. Spices are reputed to possess several pharmacological properties. Due to geographical, ethnical, and traditional differences, rasam recipe and the preparation process have a wide difference. Hence, the objective was to standardize rasam and then to perform a chemical analysis so that its pharmaceutical potential beyond nutritive effect can be explored. Materials and Methods: The quantity of ingredients and the process followed for preparing rasam by the 17 volunteers selected from in and around Vellore, Tamil Nadu was standardized. The proximate, nutritive, elemental, and phytochemical analysis were determined for the standardized rasam. Results: The total ash, acid insoluble ash, water soluble ash, and sulfated ash were found to be 1.7%, 0.04%, 0.12%, and 1.86%, respectively. The extractive values such as water soluble, ethanol soluble, and ether soluble were found to be 4.5%, 3.93%, and 0.61%, respectively. The standardized rasam showed very low-energy content of 15.13 kcal/100 g. Rasam contained alkaloids, tannins, saponins, flavonoids, terpenoids, steroids, glycosides. and volatile oil. Conclusion: The ingredients used in the preparation of rasam are medicinally claimed for various ailments, which makes it a traditional functional food. The standardized procedure provided tremendous opportunity to study the pharmaceutical potential in a systematic scientific way beyond its culinary and nutritive effect. Devarajan A, Raja MK. 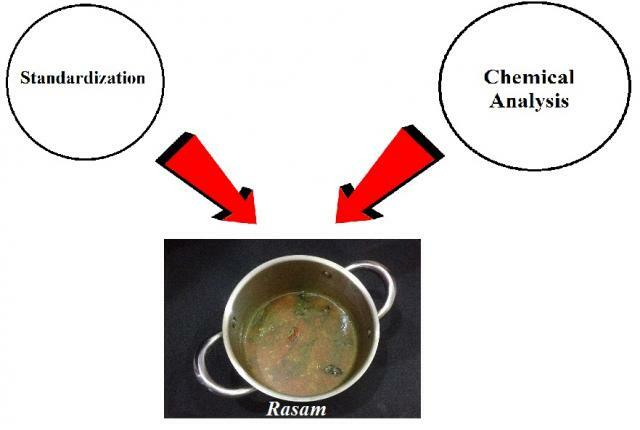 Standardization and Chemical Analysis of Rasam: A South Indian Traditional Functional Food. Pharmacognosy Journal. 2017;9(5):587-593.